The Faculty of Medicine Dentistry and Health Sciences (MDHS) recently hosted a visit from a delegation of Chinese doctors from Zheijang province. The delegation was organised by Victorian government Department of Health and Human Services to showcase the state’s current general practice training and research. This is of great interest to China given its requirement to train 400,000 GPs by 2020. Senior staff from the MMS Departments of General Practice and Medical Education presented information on their work around general practice training, and clinical teaching, ably assisted by Mandarin-speaking Dr Phyllis Lau. 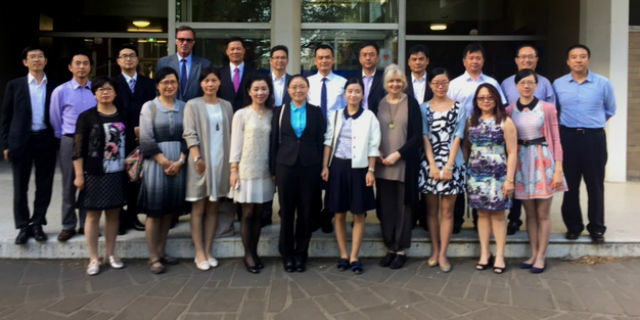 The photo shown is of the visiting delegation and includes Professor Steve Trumble (Medical Education) and Meredith Temple-Smith (General Practice) and Dr Phyllis Lau, with the delegation.